■ Continuous peritoneal dialysis is an effective treatment for patients with renal failure. ■ The open technique placement of continuous ambulatory peritoneal dialysis catheter is still the standard procedure. 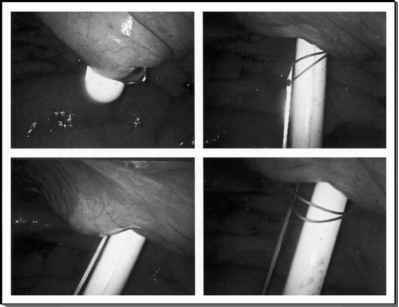 ■ The peritoneoscopy-assisted technique is very similar to laparoscopy-assisted technique and can be performed by nonsurgeon physicians (nephrologists). ■ Laparoscopy-assisted technique allows the surgeon to fix the catheter to the abdominal wall to prevent catheter migration. ■ Laparoscopy is also increasingly used as a technique for salvage of the malpositioned or blocked catheter. It is also associated with decreased infection, more rapid onset of use, decreased complication, and improved patient comfort.